This week I have an outstanding guest post by Sophia Coppolla from Onlinecollege.org to share with you. 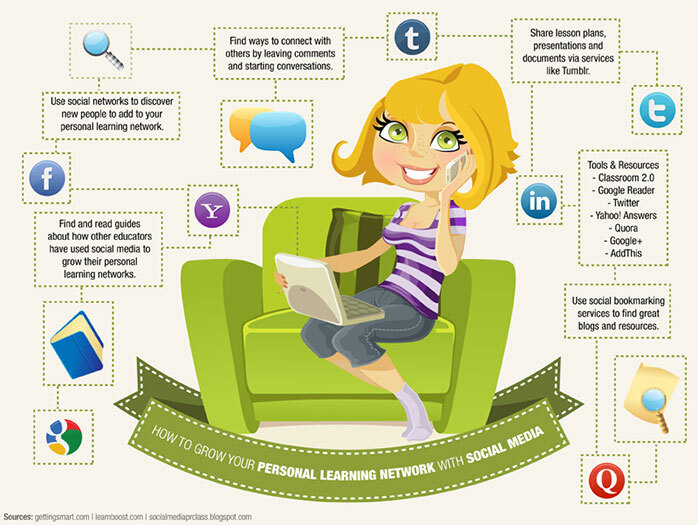 It is a detailed look at building your Personal Learning Network. This is something I spoke briefly about this past summer in Personal Learning Networks – Not Just For Adults Anymore but Sophia ramps it up a bit in her take on building your PLN with a TON more suggestions and resources. It is a great read and I am very pleased to present it to my readers. Personal learning networks are a great way for educators to get connected with learning opportunities, access professional development resources, and to build camaraderie with other education professionals. Although PLNs have been around for years, in recent years social media has made it possible for these networks to grow exponentially. Now, it’s possible to expand and connect your network around the world anytime, anywhere. But how exactly do you go about doing that? Check out our guide to growing your personal learning network with social media, full of more than 30 different tips, ideas, useful resources, and social media tools that can make it all possible. Get started developing your social media PLN with these tips and ideas for great ways to make use of social tools. Actively make ties: It’s not enough to just follow and read, you need to connect. Leave comments, reply to questions, and start your own conversations. Join Twitter chats: Educators can chat, collaborate, and connect through Twitter chats like #edchat and #edmeet. Share your lesson plans, presentations, and documents: Use services like Tumblr, Edublogs, or Facebook to share lesson plans with your learning network. Crowdsource ideas: Turn to your PLN to crowdsource ideas or perform social searches. Use Twitter resources to discover more people to follow: Check out following/follower lists, RTs, #followfriday suggestions, and Twitter lists of the people you admire to find even more great resources to add to your PLN. Discover new people to add to your network: Lots of educators use social media as a passive way to check out people they’d like to add to their personal learning networks. Analyze the quality of their posts, point of view, and signal to noise to decide if they’d make a good addition to your network. Start conversations: Use your social media accounts to ask questions and spark conversations that encourage new thinking. Find new blogs and resources to follow using social bookmarking: Social bookmarking services like Diigo and Delicious can help you not only find great blogs and resources, but also get your connected with other educators to add to your network. Check out these guides to find out how other educators have used social media and other tools to grow their personal learning networks. How Technology Helps You Build a Personal Learning Network: Explore technology’s new role in building personal learning networks through this guide. 50 Great Ways to Grow Your Personal Learning Network: Our very own guide to growing your personal learning network has lots of great ideas for tapping into social media. The Innovative Educator: 5 Ways to Build Your 1.0 and 2.0 Personal Learning Network: Check out this post from the Innovative Educator to see how you can use blogs and other social media to build a personal learning network. How to Use Twitter to Grow Your PLN: Here, Edutopia shares an insightful post on why educators should use Twitter to grow their PLNs, plus a great list of chats to join. 21st-Century PLNs for School Leaders: Take your PLN into the next century with this guide for using social media tools like Twitter and blogs to grow your PLN. How to cultivate a personal learning network: Chuck Frey’s post explains how you can cultivate a strong personal learning network, through social media and beyond. Tools for Building Your Personal Learning Network: Check out this LiveBinder to find several great tools for building a personal learning network. Using a Twitter Chat Channel to Support a Personal Learning Network: Check out this guide to see how one Texas school district is using a Twitter chat channel to support a PLN. Using Social Media to Develop Your Own Personal Learning Network: This presentation from Sue Beckingham and David Walker is a great resource for learning about the many ways you can use social media to grow a PLN. Nuts and Bolts: Building a Personal Learning Network: Jane Bozarth’s article on building a personal learning network hits on the need for interactivity in PLNs. Want to really make the most of your PLN? Use these popular social media tools for learning to grow and take advantage of your network with the latest technology. Classroom 2.0: In this networking group, you can get connected with other educators who are interested in Web 2.0, social media, and more in the classroom. Ning: On Ning, you can create your own social website to bring your PLN together all in one place. Diigo: Collect, highlight, remember, and share all of the great resources you find online with your PLN on Diigo, and annotation and online bookmarking tool. Google Reader: With Google Reader or any other great RSS tool, you can subscribe to blogs and stay on top of it all. Slideshare: On SlideShare, you can upload presentations to share with your personal learning network. Twitter: Perfect for finding people to add to your PLN, participating in chats, and sharing what you’ve found, Twitter is one of your most powerful tools for growing and maintaining a personal network. Facebook: Another powerhouse for PLNs, Facebook is a great place to connect, share, and grow your network. Scribd: Read, publish, and share documents on Scribd with your PLN, whether you’re sharing classic novels or lectures you’ve delivered. Plus, you can find documents and get connected with their owners. Yahoo! Answers: Find and share information, connect with others, and build upon your personal learning network on this popular answers site. LinkedIn: The gold standard in professional networking, LinkedIn is a great place for education professionals to get connected. Quora: Similar to Yahoo! Answers, Quora offers a professional place to share your knowledge and grow your network. Google+: Often overlooked in favor of Facebook and Twitter, Google+ is a growing network that offers lots of great possibilities for developing PLNs. Pinterest: Facebook, Twitter, and Google+ get a lot of love from personal learning networks, but Pinterest offers a great way to find other educators, and great resources. Delicious: One of the most popular social bookmarking sites on the web, Delicious makes it easy to share what you’ve found and find new followers for your PLN. Paper.li: Using Paper.li, you can curate and share your favorite PLN tweets on a daily basis. Scoop.it: Like Paper.li, Scoop.it is a great tool for curating an engaging PLN magazine based on resources from your network. AddThis: Become a sharing machine with the AddThis toolbar, a great way to immediately share web resources on the web’s most popular social media tools.